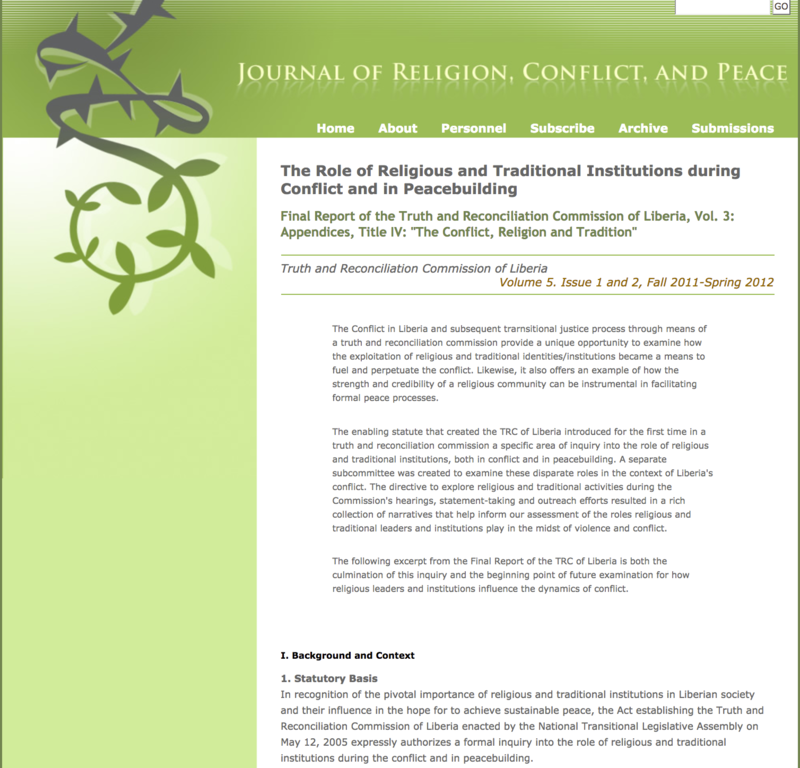 Final Report of the Truth and Reconciliation Commission of Liberia, Vol. 3: Appendices, Title IV: "The Conflict, Religion and Tradition"
The Conflict in Liberia and subsequent trarnsitional justice process through means of a truth and reconciliation commission provide a unique opportunity to examine how the exploitation of religious and traditional identities/institutions became a means to fuel and perpetuate the conflict. Likewise, it also offers an example of how the strength and credibility of a religious community can be instrumental in facilitating formal peace processes. The enabling statute that created the TRC of Liberia introduced for the first time in a truth and reconciliation commission a specific area of inquiry into the role of religious and traditional institutions, both in conflict and in peacebuilding. A separate subcommittee was created to examine these disparate roles in the context of Liberia's conflict. The directive to explore religious and traditional activities during the Commission's hearings, statement-taking and outreach efforts resulted in a rich collection of narratives that help inform our assessment of the roles religious and traditional leaders and institutions play in the midst of violence and conflict. The following excerpt from the Final Report of the TRC of Liberia is both the culmination of this inquiry and the beginning point of future examination for how religious leaders and institutions influence the dynamics of conflict. The Journal of Religion, Conflict, and Peace addresses both the problem of religion and conflict and the possibility and practices of peace, giving particular attention to peace. Articles address everything from interpersonal relationships to international politics and draw from any discipline or combination of disciplines that can illuminate the journal's central concerns. While the journal’s first audience is scholars, its aim is to be relevant and accessible to peace practitioners and anyone else concerned about these themes.